Since KDE4, Kalzium is able to display different iconsets. Of course, to display iconsets you need to have the icons, in the first place. What do you mean by 'Iconset'? The word "Icon" is a bit misleading. When I say icon I mean an illustration of an element. For example, carbon is used for many many things like your crayon or in the framework of cars. So the "icon" for carbon could be the picture of a crayon or a car/sailing boat. Of course, an element might have a lot of applications. This means the many icons might fit for an element. 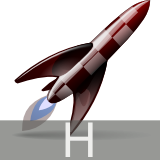 For example, I currently have several icons for Hydrogen. Also, radioactive elements are not used (outside power plants). That is why they will all get the same icon (unless I find a good reason to do otherwise). If you have artistic abilities then you might want to help out Kalzium! This is a good example of how Kalzium would look like, I "just" need the images, the code is done. So if you have artistic skills and some free time I would really welcome your help! Per element one svg-file is needed, I would do the rest. Even if you would only create one or five icons, each icon would help a lot! I created a list of ideas what each icons could display. You find the list here. The icons need to be 40:40 (x:y ratio). Put the symbol of the icon in the grey box at the bottom. Please start with the template file if you start a new icon. If you have an icon you can send it to Carsten (cniehaus _at_ kde _dot_ org) or Kalziums mailinglist. What to do in order to have a consistent iconset? You should use the palette defined by Oxygen. You will find the file here. You will find detailed instructions how to use the palette here. The icons have to have a 1:1 (x:y) ratio. That is because the icons will be displayed with 40:40 pixel. Add the symbol of the element to the bottom of the icon. Have a look at the example-icon how to do it.